His power: No real powers, but as Bruce Wayne’s longtime mentor/butler, he’s one of the few people with the guts to call Batman out when he’s being ridiculous. 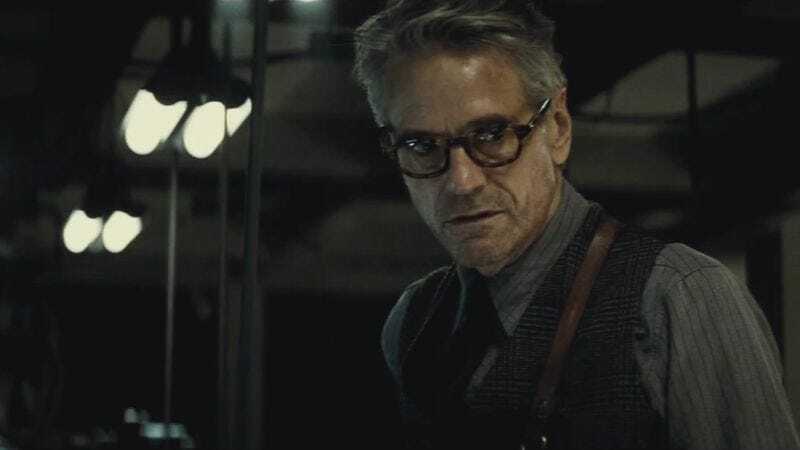 His story: Alfred has only appeared in Batman V Superman: Dawn Of Justice, but that film made it pretty clear that he’s almost as tough as Batman himself. Alfred used to be a member of the British Special Air Service before working for the Wayne family, and his military training unexpectedly came in handy when Thomas and Martha were killed and he was left to take care of the young, vengeance-hungry Bruce Wayne. Once Bruce started wearing a mask and beating up criminals as the Batman, Alfred became less of a butler and more of a partner, maintaining the Batmobile and remotely operating Bruce’s wonderful toys while he’s busy punching villains. As the years have gone on, though, Alfred has apparently become less accepting of Bruce’s violent quest to clean up the streets of Gotham and is now more than happy to make a snide comment about his boss’ wrongheadedness when he makes a poor decision—like, for example, when he tried to kill Superman. Currently, Alfred Pennyworth is: Most likely hanging out in the Batcave, grumbling to himself and wearing stylish suits. Where will we see him next? With Jim Gordon set to appear in Justice League, Alfred almost certainly will as well.